Having established this chaos situation, and because it seems that the littlest ones love to practice “track and field”, I had to move my “office” with a gorgeous city view, to a corner (literally speaking). But if I was going to move and change this view, I had to gain something in return, wouldn’t you agree? Well, in comes Target and some gorgeous accents (a few in a very good price!) to upgrade this sad future office corner. 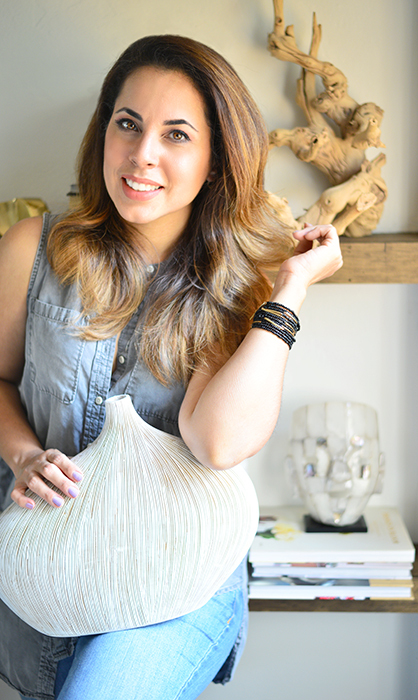 Sometimes the smallest accessory can make a great statement in decoration. I’ve been holding to this beetle for sometime. Now I know it finally found its place in this house, other than a side table. 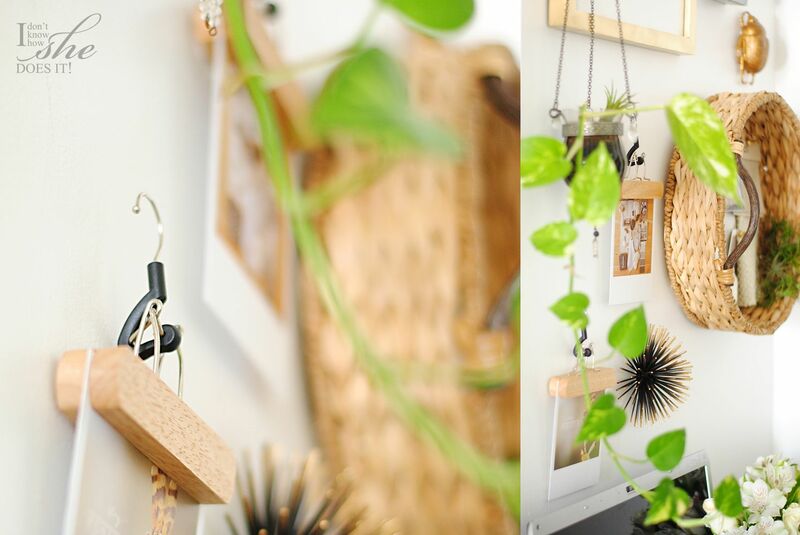 These Umbra Loft Photohangers are ideal for hanging fabric samples, small pieces of art besides the common photography. I’ve found many uses for this basket. But the latest one is of a mood board. 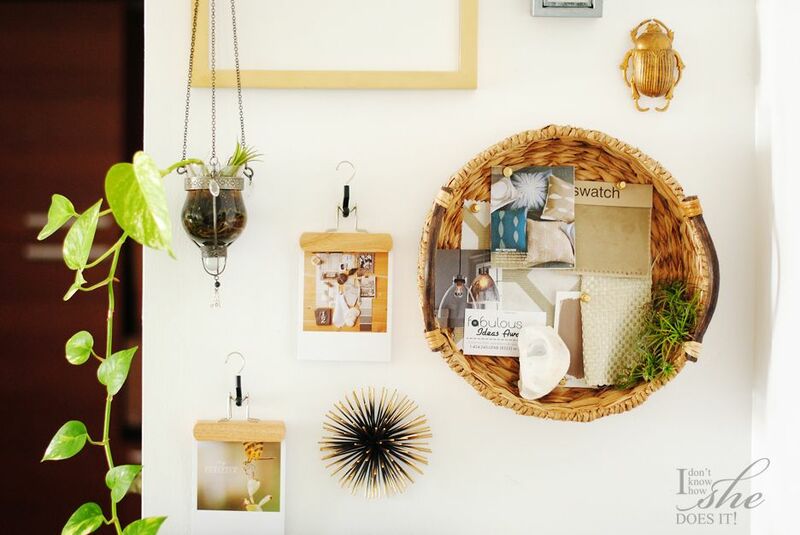 One of the perks of it being a basket is having the opportunity to take it off the wall and directly to the client after all the materials and inspiration has been gathered. Just as I’m about to do with this project for client’s master room (details coming in a near future!). Fabrics are from U-Fab (except the one that reads “swatch”) and the small square art from Emily Jeffords. I also framed a “Thank You” card from Wink (American Greetings) using cork in the background. The same goes for the arrow from a past collection of Nate Berkus line at Target. 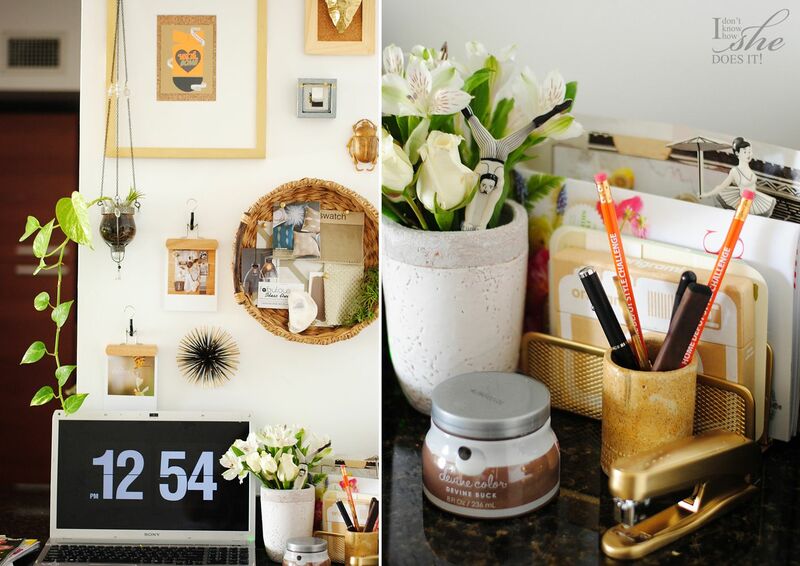 While completing my “office corner“, I found that if perhaps I spray painted some of my supplies with a gold color, they will add a bit of glam to this area. So I did paint the stapler and letter sorter with Rust-Oleum Specialty Metallic in Gold. Loving it! 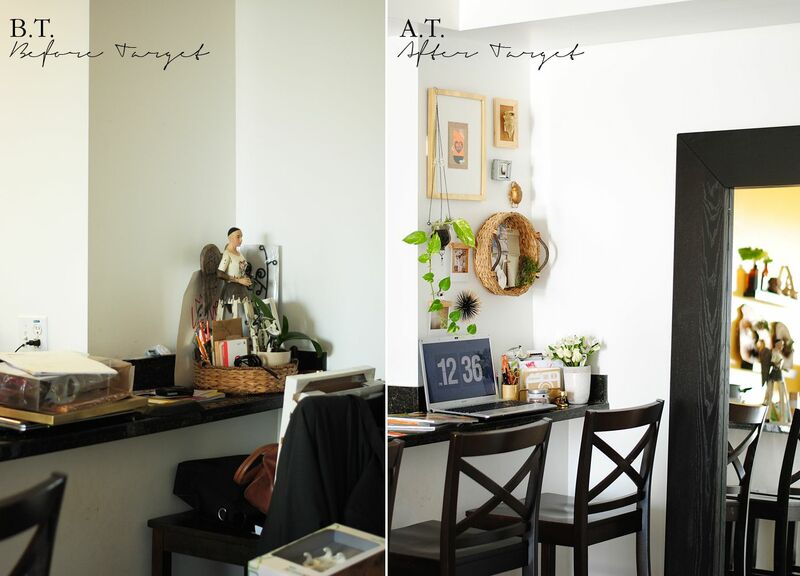 The transformation from a lifeless nook to a happy little office corner. Hope you enjoyed this quick office corner upgrade. Would love to know know what you think of it! Share your thoughts! I LOVE this idea! I too have a teeny corner "office" in our apartment and I can tell you that mine does not look half as organized as yours! 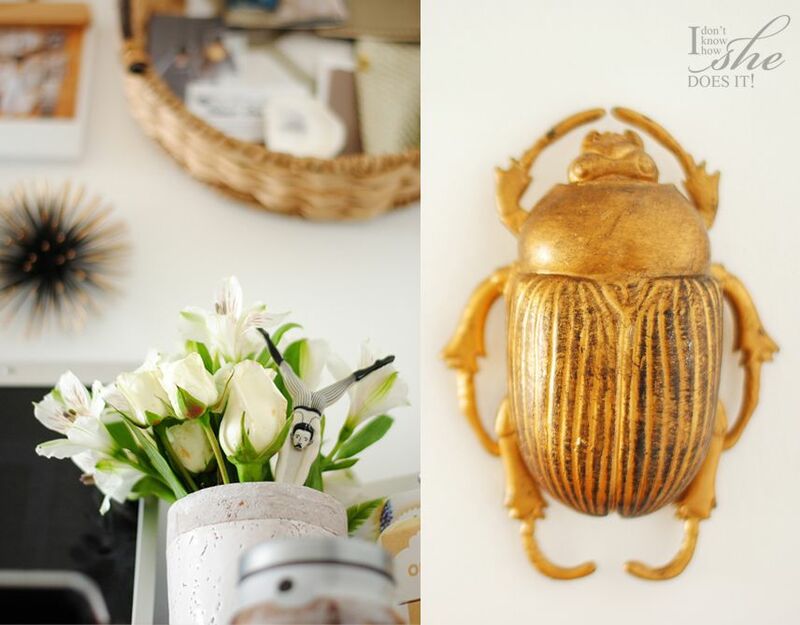 Also, I love the golden beetle, I'll be on the lookout to grab one for myself! Wow Christa, how quickly was this response from the post. I'm sooooooooo happy you liked it. Isn't that beetle a cute accent! Hey, and between you and me, my office doesn't look like this everyday, hahahaha. Have a great day and thanks for stopping by! what screen saver is this for your mac? Hello there! It is called Fliqlo. Here is the link and hope it works http://9031.com/goodies/#fliqlo. Thanks for stopping by! 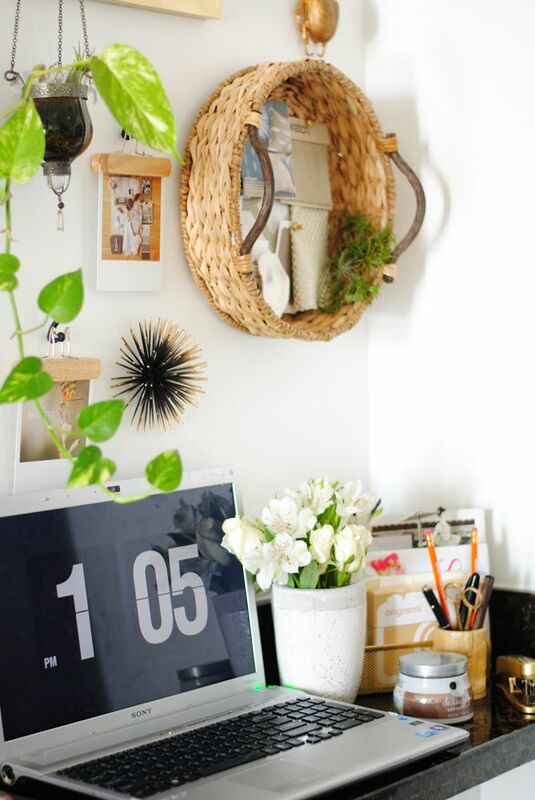 I love your little office space! I'm loving the gold accents. Beautiful photos, too. Thank you so much, Lindsay. 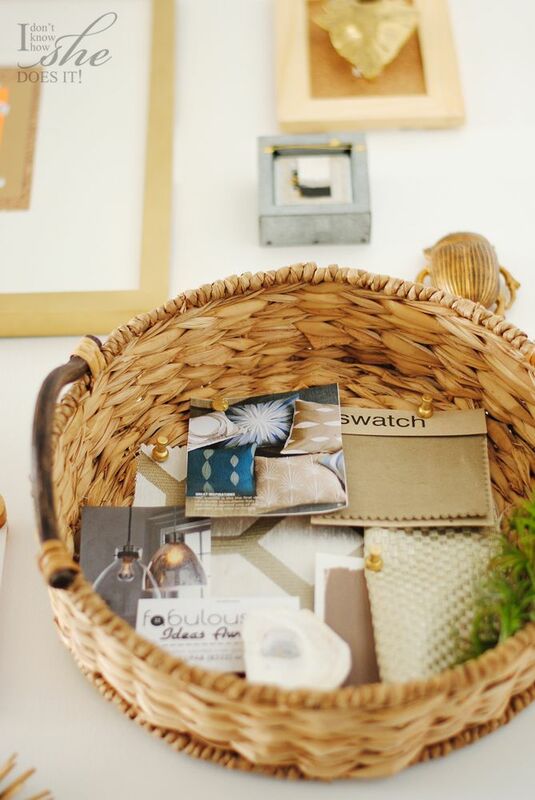 I think the gold accents is what makes this small space to easy to love! A bit of glam, perhaps?!?! Have a great week ahead. I love the changes you made to your office space. You have such great taste. I love the style of your home. Happy to meet you here! Oh, thank you Brandi!!! I'm the one who's happy to have your visit in my blog. Appreciate your lovely comment! Thank you so much Tiffany for your kind comment. I know all about the beetle hahahaha! Have a great weekend. Love it Gloribell, it has a modern & chic look with a 'cozy feeling'. Loved how you perfectly described my decor intentions. Thank you so much Regina!